Baltimore's first large municipal park, Druid Hill, is commonly known for its shady lawns, rolling hills, picturesque water features, and majestic forest. The history of Druid Hill Park began over two centuries ago when the Susquehannock Indians ceded land, including the area of the park, to Lord Baltimore in1652. It is believed that Druid Hill would have been a desirable place for American Indians because of its access to the Jones Falls Stream as well as the multiple springs at the site. Formerly the estate of George Buchanan, one of the seven commissioners responsible for the establishment of Baltimore City, his holdings included 579 of the 745 acres that comprise Druid Hill Park today. In 1709, the land was acquired by Lloyd Nicholas Rogers who maintained the site as a plantation for many years, relying on the labor of enslaved African Americans. Before it was sold to the city by Rogers’ grandson, the property had been laid out in the style of an English country landscape park, serving as a backdrop for its future development as a park. Purchased in 1860, the park was developed as part of a nationwide movement to provide large parks for urban dwellers (Central Park began development in 1858). This movement followed in the tradition of European parks developed in the picturesque garden style. Druid Hill Park was primarily used for strolling, driving, riding and ballgames. Its numerous water features included natural springs, streams and lakes that also functioned as drinking water reservoirs for the citizens of Baltimore. Druid Hill Lake began construction in 1863 and remains the largest earthen-dammed lake in the country. 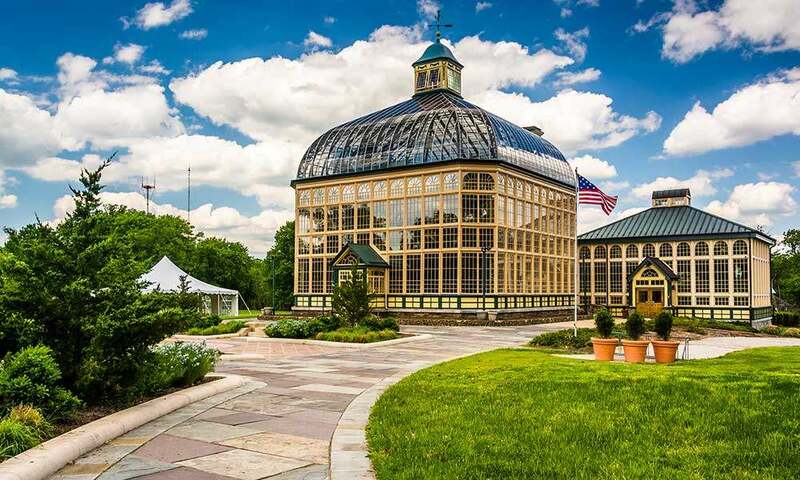 Other sites in Druid Hill include the Howard Peters Rawlings Conservatory, opened in 1888 and the country's second-oldest Victorian glass conservatory, and the Maryland Zoo, which was established in 1876 as a result of people donating various animals to the park. The park also has numerous amenities, including multiple playgrounds, basketball and tennis courts, a pool, and athletic fields.